As I was checking the wearability of every item in my closet I noticed that several favorite shoes were scuffed in the toe area. Not ready to kiss them good-bye, but not willing to wear them that way either, it dawned on me that a felt marker could be an instant repair tool. The black ones were easy – I had black markers on hand. But Michaels carries Sharpies in 28 colors including brown, navy, 3 shades of gray and red – a quick fix for $1.79. If that color range doesn’t meet your needs, check out Copic markers’ assortment of 53 neutrals at $7.99 each. WARNING: For color geeks, these could become highly addictive. I think I counted 283 additional colors – enough to give a person serious debt. As well as serious fun. I love my gray tote bag – it’s as neutral as black but not nearly as boring. But I’ll admit, I tend to overload it (sound familiar to anyone?) so as the straps stretched just slightly under the excess weight, the synthetic edge strip started to crack and peel away. That left the unfinished edge of the un-dyed filler showing – ugly! Marker to the rescue again! 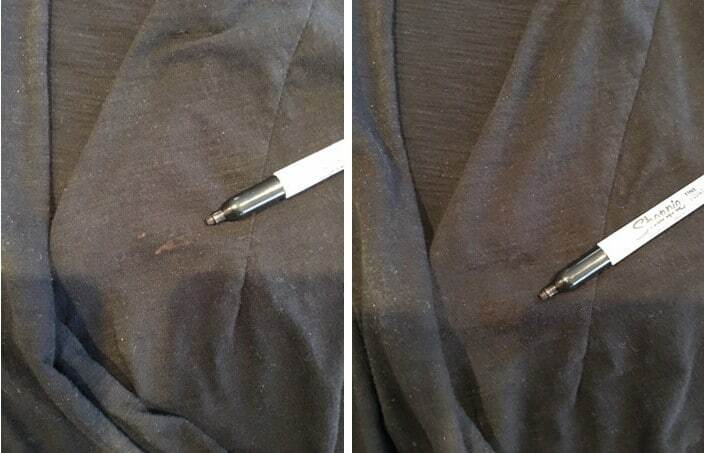 What “Sharpie Saves” could you perform in your own wardrobe? My husband wears suits and/or tuxedos regularly and has worn some to the point that the sleeve edge or lapel edge has worn through. When that happens we get a bit more life from it by trimming the loose threads and using a black marker to color the fray and any interfacing that is showing through. This has worked well for MANY years! I used to work at a hospital and the nurses swore by alcohol wipes to clean black scuff marks off shoes. You sometimes have to get the yuck off before you can touch up the color. Yes, I’ve used Sharpie markers on my shoes. I’ve also used them to touch up fade marks on black pants. Or to cover up bleach spots. I’m going to buy a package of colors to cover my interfacing in buttonholes. Then I can color the interfacing to match the garment. No more white interfacing poking through. Wow – some great tips! I dye my black and navy pants and jeans periodically to keep the color deep and dark, but I can see how a marker would work for small areas. And I LOVE the idea of coloring interfacing behind buttonholes – that’s just brilliant! I also re-dye my dark pants and also wash them inside out to reduce fading. My front loader washer helps a lot. It’s gentler on the clothes. BTW Sharpie has a giant collection on every color and pen they make. I will post a link when I find it online. They are called Ultimate Collection. They come in 72 or 115 pieces. And they are available online and in stores. Check it out.